ABLE Instruments are the exclusive UK representative for the Computrac Vapor Pro XL. 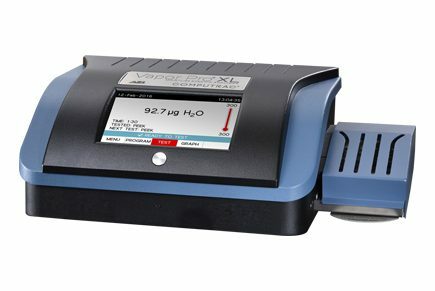 Improved repeatability, precision, flexibility and an advanced user interface – the Vapour Pro XL is the latest in moisture specific analysis technology. It is ideal for any application in which Karl Fischer titration is used. It features an upgraded heater and increased control over testing temperatures. This moisture specific analyser is also compatible with multiple sizes of sample vials and is equipped with stepped temperature testing capabilities for enhanced method development. Offers moisture specific analysis that correlates well with Karl Fischer without hassle or expense of hazardous chemical reagents, costly glassware or time consuming maintenance. Features a brand new colour LCD touchscreen and an intuitive interface that require minimal training or existing knowledge base to operate. Everything is menu driven so that you’ll get accurate results regardless of who runs the test. Comes with an upgraded heater, which increases the upper limit for testing temperatures to 300°C. The upgraded heater also allows for improved control over testing temperatures. Stepped temperature testing capabilities with improved temperature control that make method development easier than ever before. Allows users to test samples without removing them from their sample vials. User adjustable ending criteria of prediction, rate, time and time then rate to optimize performance and test results. Stores up to 250 test programs and retains the last 1000 test results and last 100 test graphs, enabling users to view and select past test results for statistical analysis and test a variety of samples with ease. Features built in self diagnostics that routinely monitor system conditions and report abnormalities in the hardware, software, moisture sensor and flow system. Optional web server allows users to download calibration reports, view what is currently on the screen, download the audit log, and upload and download test programs, results and graphs.